If I could have one, and only one, appliance for my kitchen, I might have to choose a slow cooker. 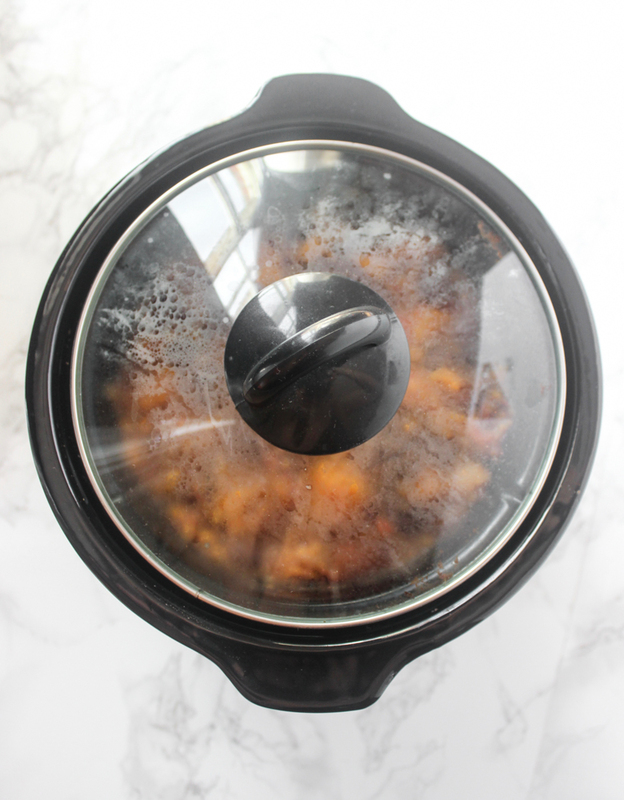 As a college gal cooking for one, my mini slow cooker is a lifesaver. It honestly feels like a magical cooking pot. I can do 10 or 20 minutes of prep work and then come back hours later and have a hearty, delicious dinner waiting for me. I’ll make a big batch of soup or stew in the slow cooker and invite a friend over to enjoy dinner with me, or I’ll enjoy leftovers for a few days or freeze the rest. Freeze in mason jars or airtight plastic containers and then defrost in the refrigerator before reheating to enjoy again. 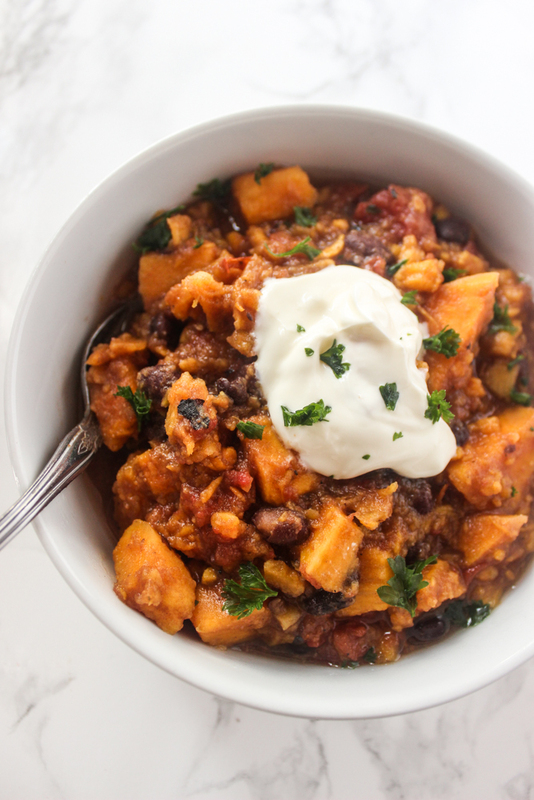 This Sweet Potato and Black Bean Chili is one of my favorite recipes to make in the slow cooker since it takes so few ingredients. It’s absolutely delicious with just a hint of spiciness and sour cream and cheese on top. Just peel and chop the sweet potato, open the cans of tomatoes and black beans, and add everything to the slow cooker along with water and spices. After cooking for several hours, use a potato masher to lightly mash some of the stew which gives it a thick, hearty consistency. Peel and dice sweet potato. 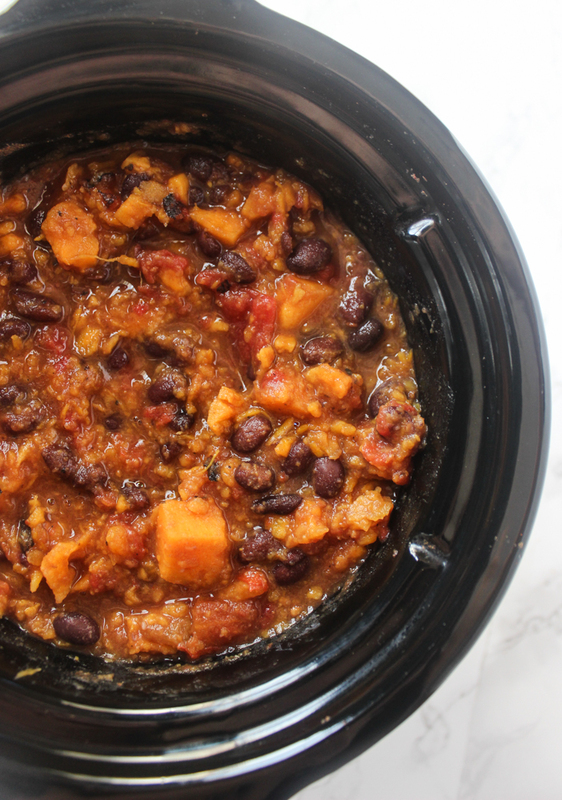 Add sweet potatoes, canned tomatoes, black beans, water, and spices to slow cooker. Using a potato masher, lightly mash about half of the stew to thicken it. Serve with sour cream and/or cheese on top, optional. Home Chef Tip: To thicken any hearty soup or stew full of veggies and beans, lightly mash part of it up just a bit. 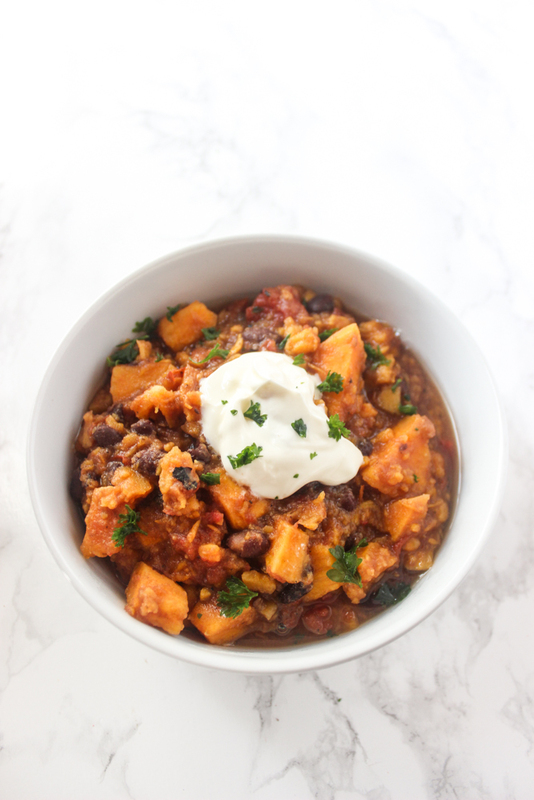 We hope you love this Slow Cooker Sweet Potato and Black Bean Chili recipe from SoFabFood Contributor, Liv from Healthy Liv, as much as we do. If you love this recipe, be sure to visit our Slow Cooker section for more easy weeknight meal ideas. For daily recipe inspiration, like us on Facebook, follow us on Pinterest, and stop by our Google+ Community to see all of the amazing recipes our community members are sharing. Enjoy! I don't eat tomatoes- any suggestions for a substitute? Hi Patty, Since the chili is tomato-based, I wouldn't recommend substituting them out. I would recommend looking for a white chili recipe if you avoid tomatoes. Thanks! Go ahead and add one if you'd like! I'm still trying to get over "vegan/vegetarian" chili recipes, but this looks good. We don't have access to fire roasted tomatoes unless we make it ourselves, so will add a bit of smoked paprika to make up for it. Question though - how big are your sweet potatoes? In my country they range from anything from say 200g to more than 1kg. Agreed with @Sib, an onion or 2 will be added. How much sweet potato do you have in mind? The ones I buy are usually 2 or 2 1/2 pounds each. Depends on how hearty you want it to be. One to two cups is ideal. Well, that was a quick and easy meal and pretty good, too! I did have to make a few adjustments based on what I had at home. I used kidney beans instead of black, I used a can of regular diced tomatoes instead of fire-roasted. And then because I thought it might be lacking in flavor because I didn't use fire-roasted toms, I added about a half cup of salsa. Yipes! That was pretty danged spicy hot so I then added a can of refried black beans into which I stirred about a half cup of hot water and about a half cup of orange juice. It toned everything down to a perfect level of spiciness for our tastebuds. But next time I'll make as written in the original recipe. I'm looking forward to seeing how it all tastes for tomorrow's lunch. Thanks for an easy recipe!